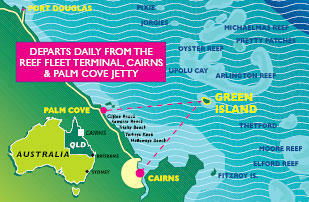 Cruise to Green Island from Cairns and find a tropical paradise on the Great Barrier Reef. You'll spend either four or five hours at Green Island, with plenty of time to snorkel or scuba dive, tour the reef on a glass-bottom boat or view coral from a semi-submersible submarine. The beautiful coral cay of Green Island is a protected Marine National Park, topped with emerald rainforest and surrounded by white sandy beaches and magnificent coral reefs. The marine life includes endless varieties of colorful fish, turtles, giant clams, shells, starfish and sea anemones.Green Island is 15 nautical miles (27 kilometers) from Cairns, and you'll cruise there aboard an air-conditioned catamaran with spacious, luxurious cabins and decks to enjoy Queensland's warm, tropical climate.En route to Green Island you'll see a snorkeling demonstration and an informative presentation on how you can make the most of your day on Green Island. There are so many activities to choose from: glass-bottom boat tours, semi-submarine coral viewing tours, scuba diving and supervised snorkeling trips. A buffet lunch is served aboard the catamaran for those who have chosen this option and a licensed bar offers refreshments throughout the day.You can also visit Green Island Resort to browse through the shops and use the facilities, including showers, change rooms and restrooms. canoes, surf skis, sailboards, shade umbrellas and beach lounge chairs are available for hire. The island also has short walking tracks through the national park.There are two departure times to choose from, 9am or 11am and different package options to select from. You have the flexibility to mix and match the inclusions to make this Green Island experience suit your needs. From a cruise only package that includes a glass bottom boat tour or the use of snorkeling equipment to the ultimate Green Island experience which is also inclusive of transfers from your Cairns hotel, a buffet lunch and semi-submarine tour, the choice is yours. A surcharge of AU$4 per adult andAU$2 per child is payable on check-in if pickup is required from hotels in Palm Cove, Clifton Beach, Trinity Beach, Yorkey’s Knob, Holloways Beach, Machans Beach, Lake Placid, Crystal Cascade and Redlynch.